NEGROMANCER 2.0: Image Comics Goes to the "Black Light District"
Jesse Blaze Snider and co-writer/producer Will Knox’s groundbreaking online comic book/music anthology will appear in print for the very first time this October 2016 from Image Comics. 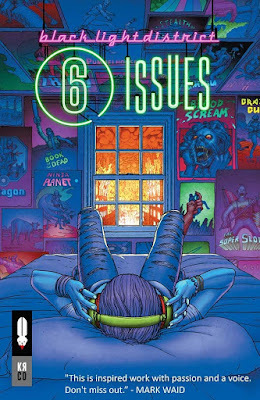 In BLACK LIGHT DISTRICT, comics and music come together to tell six separate stories with one thing in common: everything is at stake. BLACK LIGHT DISTRICT: SIX ISSUES (ONE SHOT) (Diamond code: AUG160593) hits comic book stores Wednesday, October 12th, 2016. Final order cutoff deadline for retailers is Monday, September 19th, 2016.